A closed-off staircase at Montclair High School. 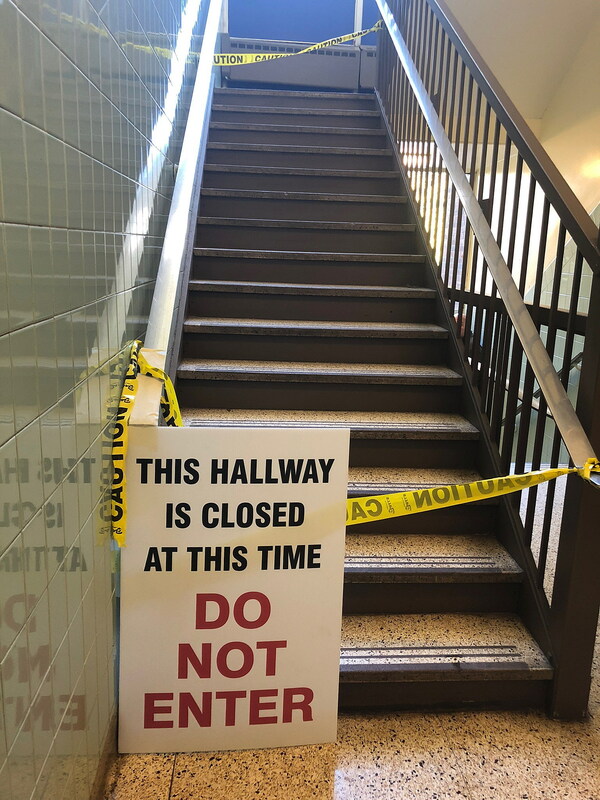 The four bids received by the district to rebuild Montclair High School’s four outdated staircases and asbestos removal in the stairwells have been rejected. Three bids came in over bid of the district’s bond resolution amount of $1.5 million, and another bid was rejected for not including sufficient documentation. Four staircases in the high school have been closed off since one partially collapsed in September. The district’s architects have recommended that all four stair wells be rebuilt, along with the asbestos removal. All four bids were formally rejected during the board of education’s Monday, March 18 meeting. The bids for the construction came from four companies: GL Group, Grove Contracting, Molba Construction, and WallKill Group. The first of the bids, from GL Group, met the district’s budget, but the bid package was found to be missing some important information. “It has been determined that [the bid package] contained a number of defects,” including missing appendix, according to the resolution rejecting the bids. GL Group’s bid is $1,524,000. The other three bids are more than what the district can spend. WallKill Group’s bid came in at $1,753,000. Molba Construction submitted a bid of $1,856,360, and Grove Contracting submitted a bid of $1,784,600. The township last week approved a bond ordinance for $2.31 million for the stairwells and asbestos work. Business Administrator Emidio D’Andrea said he did not think construction would be delayed even with the district having to go back out to bid. The main high school building will close in May for asbestos removal. Once that work is complete, then work can start on rebuilding the stair towers.